I have looked at headstones since childhood, when my father would take me to obscure churchyards, having learned that this or that person could be found there. He showed me that history, the kind that meant something to me, could be found in these quiet spaces, finding his leads in books and archives. In 2012 I created a year long blog about the area I had moved to, posting a photo every day about some aspect of it, and included a visit to the local cemetery. I was surprised to see military headstones there, their clean lines and pale stone distinguishing them from the marble angels and granite kerbs that mark the last resting places of the suburban dead. That was when I learned that there are thousands of war graves, cared for by the Commonwealth War Graves Commission, in the UK and other countries, far from the huge cemeteries in France and Flanders where I might have expected to find them. Armed with information from the CWGC website I began to visit other burial grounds within a bus ride of my home. Thus it was that I entered the gates of Havelock Cemetery in Southall, Middlesex on a cold December day in 2016. I had come in search of two Russian pilots, killed in accidents at Northolt a century ago, but found that I was as interested in the people around them. 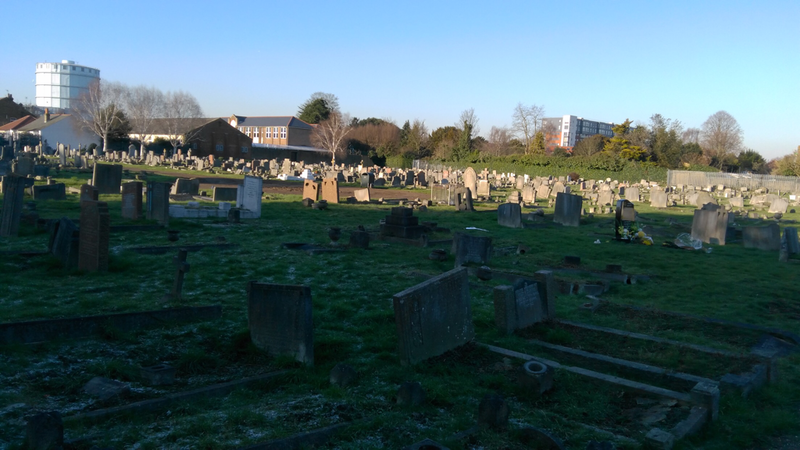 I realised that the cemetery, opened in 1883 to accommodate the dead of a growing town, reflected Southall's history and development into the thriving suburb within which it is now almost hidden. It was an archive of the people who had made the place or had been passing through and never left. There were the graves of those who had died in the service of this country, and of others, but there were many more of those who had gone to war and survived. They included that of William George, but I did not know his name then and it took me some effort to discover it. 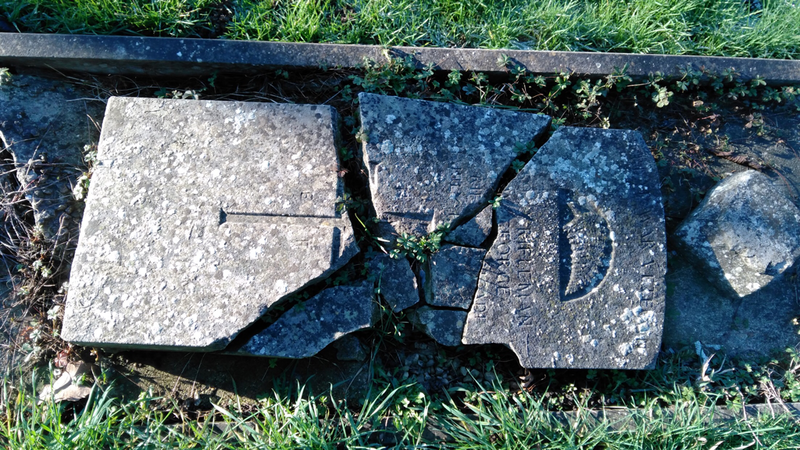 There was an intriguing, badly damaged headstone in the older part of the cemetery that appeared to be of the CWGC type. It had the same simple shape and the fern emblem of New Zealand. Photographs taken in bright sunlight helped me make out words suggesting it marked the grave of a veteran of the Great War, a rifleman, and the name "George". I knew that there were eighty-three graves listed on the CWGC website as being at Havelock Cemetery and that they included Belgian, Russian, Australian and Canadian personnel. There was no mention of a New Zealander. I had never seen a headstone of that kind for a veteran. Why had a serviceman of another country been honoured in this way four decades after the conflict had ended? The CWGC were able to confirm that it wasn't one of theirs. The stone it was made of seemed to be of a poor quality, more like concrete, and it had been positioned at the foot of the grave. At some point it had fallen back onto something that had caused it to split into pieces. It was impossible to tell how or when this had happened. I began to research William's background through census and baptismal records and, with the help of some experts, discovered a story of migration and war. William George was born in Harlington, Middlesex in 1890. His father, Thomas, worked in a brickfield and his wife, Mary Ann, had borne him eleven children by the time the family had moved to Havelock Road in Southall. Thomas died at the age of 45 and was the first member of the family to be interred at the cemetery. They must have followed the work because their home was close to another brickfield but the area was attracting other industries. William's siblings worked at factories producing jam and margarine, relatives by marriage were employed by railway companies. Some of them must have felt that opportunities there were too limited and in 1913 William (by now a "machinist box maker") followed his brother Edward, sisterEliza and brother-in-law John to New Zealand. By 1917 William was employed as a brickmaker in Wellington. I learned this from his service record as, by then, New Zealand was involved in the First World War. He was back in the UK in September of that year, a rifleman in The New Zealand Rifle Brigade and in France in December. By the time his battalion was engaged in combat William's older brother Harry had died of tuberculosis. The George family were probably still coming to terms with his loss when, a few months later, the news arrived from France that William had been wounded. Battlefield guide Scott Brand was able to explain the circumstances in which this happened. "William was with the 2nd Battalion 3rd NZRB, and they were involved in the fighting on the Somme in 1918 in the northern sector around the south of Hebuterne during March. The 3rd and 4th Battalions took over the trenches to the south and east of Hebuterne on the 18th June, and on the 25th June the 1st and 2nd Battalions relieved them in the lines. It was during this time on the 25th that William, with the 2nd Battalion, was wounded. There was no particular battle at this time as the German offensive Operation Michael had stalled and it was prior to the British offensive in August,however artillery fire and trench raiding would have been a regular thing. It can be safely said he was wounded in in the trenches at Hebuterne." William was lucky to survive. Described as "dangerously ill" he had received gunshot wounds to his arms and legs and arrived eventually at the 5th General Hospital in Rouen where infection must have set in. His right leg was amputated. The slow recovery that began in France continued at military hospitals in the UK. A year later, following his return to New Zealand, he was discharged "on account of wounds received in action" in December 1919. It was probably difficult to find work as an amputee and in September 1922 he returned to Southall, any dreams of success and opportunity abroad undermined by his disability. Goodwill towards a former employee and family connections may have ensured he regained his old job at a time at a time when ablebodied men back from the war were being favoured over the injured. He got married and divorced, and lived out his remaining years in Southall. I wonder if he took his place by the war memorial on The Green with the others each year, in November. And so we come to the reason why this veteran got a soldier's headstone. During my research into his time in New Zealand I came across an inventory of memorials at the cemetery where one of his siblings has their grave. It records the inscriptions on them, including one with the same wording as William has on his headstone. There were others there that mention a grandfather or great grandfather's service in either world war, men who had died in their old age. New Zealanders hold their war dead and their veterans in high regard, and it seems that a niece or nephew wanted their uncle to have an appropriate headstone. How was this memorial received by surviving veterans and relatives of war dead in Southall? We will probably never know, but I have noticed in Hortus Cemetery, also in Southall, a later headstone dating from the 1960s which commemorates an "Old Contemptible". Was one inspired by the other? Eventually I published my research into William George on social media as a first step in finding his surviving relatives. 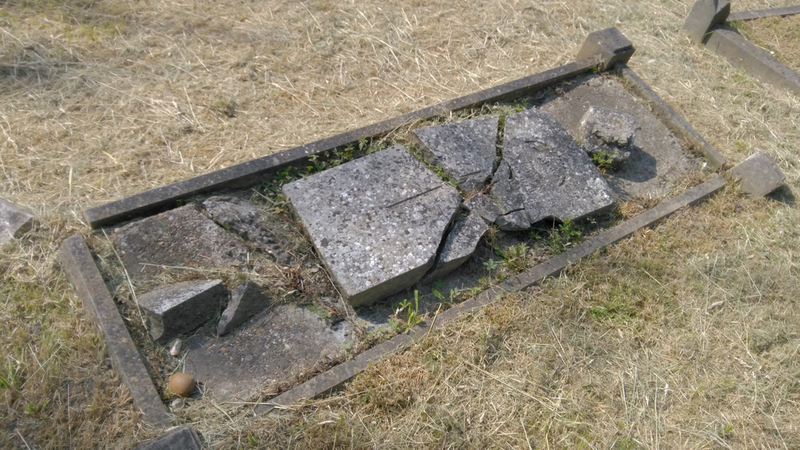 I hope that they will permit the crowdfunding of a repair of the damaged memorial, as I think it may be unique in the UK and deserves to be preserved, but I have to get their permission first as the grave is their property and there may be a reason why it has been left as it is. I wasn't prepared for the reaction from some quarters to the photo. A woman who had seen it launched her own crowdfunder for repairs via a post, including my photo, in a Facebook group. My heart was in my mouth as I read some of the comments. There were assumptions that the headstone had been vandalised ("Thugs."). Others were angry with the CWGC for not caring for it. Some blamed the local council. There were others that led me to fear that William's enraged and offended relatives might remove what was left of the memorial altogether. The post was taken down after the group's administrator finally took me seriously. I tried in vain to get a comment left on his entry on Auckland's Online Cenotaph removed for the same reason. Instead, my own comment explaining the situation was suppressed. It has made me consider our attitude to the dead and, in particular, our war dead. While the sight of a damaged military headstone can evoke enormouspassion online (especially if comments get lots of "likes"), in real life few are willing to turn out and wash the grime off one a few streets away. People in my area will turn out to a Remembrance service in November but I've failed to get many to visit war graves a little further down the road. I've realised that those who do take an interest in cemeteries sometimes come to believe that they have a claim over those they research and are in the habit of visiting. It is easy to assume that, in the hours other than the ones we spend beside those graves, no one else visits or takes an interest in them, that no one other than maintenance staff, passing foxes or cats are ever there. It is easy to end up thinking that they are "your boys". Havelock Cemetery has taught me many such lessons. As a consequence of my interest in it I've developed an even greater respect for the "ordinary" people there. They adapted to changes in the nature of the work that was available, turning from agriculture to industry. Some prospered, others saw siblings emigrate. A few had survived workhouse childhoods. Above all, they coped with two world wars, that turned insurance managers into air gunners. brickmakers into riflemen and housewives into aircraftswomen. Who can fail to be moved by the fact that the occupant of a local grave was carried home in a Lancaster that barely survived? Why are we less interested in those who returned and lived on quietly, with memories of those who didn't? Even in its present condition William George's broken headstone has done what it was meant to achieve. We often talk of the "ultimate sacrifice" made by those who died. Are those "ordinary" men who had those extra years less deserving of memorials because they had them? Lest we forget. Read Albertina McNeill’s blog and follow her on twitter. This blog piece was a contribution and remains the copyright of A. McNeill.